Niger Delta militant group, Reformed Niger Delta Avengers, RNDA, on Monday endorsed President Muhammadu Buhari’s re-election bid. RNDA declared that Buhari was the only President, who has shown practical commitment to peace and willingness to develop the Niger Delta region. The militant said they took the decision to support Buhari at a meeting by the group’s service Commanders in Benin River of Egbema, Rivers State. In a statement issued by its leader, self-styled Maj-Gen, John Mark Ezenobi, RNDA said it reviewed the activities of past presidents including Goodluck Jonathan and came up with a verdict that Buhari remained the best among them. The statement reads, “The RNDA with the coalition of the nine militant groups in the creeks has endorsed President Muhammadu Buhari for another term in office. “Buhari-led Federal Government of the All Progressives Congress (APC) has shown much commitment to address the under-developmental challenges facing the Niger Delta region for decades caused by the corrupt previous bad administration of PDP, which wasted 16 years of governance. “RNDA note with regret that the six years administration of former President Good luck ‘Badluck’ Jonathan was characterized by massive corruption, looting, favouritism and gross non-supervision of his appointees with no completed project in the long-neglected region. 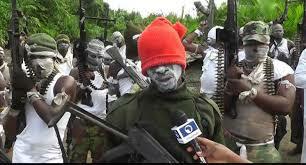 “Jonathan’s government took the people of the Niger Delta and region back to the stone age of under development”. “RNDA accepted the Federal Government’s ceasefire agreement in 2016 for dialogue. This led to the remarkable and sustained peace process in the region following renewed destruction and bombing of oil installation and facilities that crippled the nation’s crude oil output and eventually led to recession. “Most worrisome and painful is the fact that Former President Jonathan’s administration goofed on the development of the region as he was unable to complete the road to his Otuoke community in Bayelsa State. “RNDA is pleased with President Buhari’s willingness and commitment to the development of the Niger Delta since he came on board in 2015 in spite of the economic recession that greeted the emergence of his administration as the crude oil price hit an all-time low of N35 per barrel. “President Buhari fight against corruption which was the signpost of the previous PDP administrations clearly defined his stand on the development of the region. “We commend him for the smooth take-off of academic activities at the Nigerian Maritime University, Okerenkoko, and we commend the Minister of Transportation, Rotimi Amaechi for the approval for the dredging of the Escravos River to enable cargo vessels to access Warri which will, in turn, boost economic activities”.